Like the Anchor, the Starfish or Stella Mara (Star of the Sea) is a revered symbol in maritime culture. As an emblem of the Virgin Mary, it represents salvation and sanctuary in the midst of troubled waters and is a favorite amongst sailors. But there's much more to this seemingly interesting little creature than meets the eye. The Starfish is a tough little one. Much like the Lizard, if it feels threatened, it can sacrifice a limb in the name of survival. Ancient Egyptians were mesmerized by this ability and the Starfish became revered as a symbol of Regeneration and Renewal. This gift may also account for why these little creatures are known for Strength and Resilience. So, if you are in the process of overcoming a difficult time in your life, just remember, you are as tough and resilient as the little starfish. 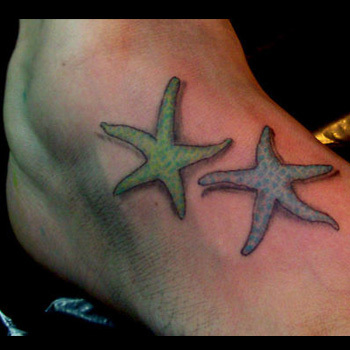 Tribal Starfish Tattoos tend to be for those persons who have a deep love for the sea. Indigenous peoples from regions with rich maritime history have many markings that represent these beautiful animals, so tribal patterns that relate to marine animals tend to be found in these areas. The Starfish is also believed to embody the protection of the Virgin Mary, so many sailors opt to get inked with a Tribal Starfish in an attempt to win her blessings and guidance for a safe voyage. It's no coincidence that SpongeBob's best friend is Patrick the Starfish. These little critters make the perfect children's story character because in real life, they are as threatening as a harmless sponge. Cartoon starfish tattoos bring back childhood memories for some people, evoke images of innocent, playful kids for most, and show off your jovial side. In twenty years, will you still love having Patrick the Starfish on your arm? One of the greatest concerns for tattoo wearers is whether or not this artwork will still be admired in the future. What does your new tattoo will symbolize? Where will it be placed on your body? To ensure that your piece will last the test of time, it pays to invest the resources needed to create a great design. For inspiration, visit our design page at www.itattoodesigns.com, where our artists can create a masterpiece for you.